Courtesy of The Craft and Folk Art Museum: L.A. Skin & Ink, is an exhibition that explores the unique role that Los Angeles played in the tattoo renaissance that took place in the United States. The exhibition will move through the 60-year transformation of tattooing from its traditional base of military and outlaw cultures into an art form of great distinction and adoption into contemporary culture. The exhibition will be in view from September 29, 2012 through January 6, 2013. Historically, tattooing was a tradition-bound art form originally associated with a small number of shops located near military bases, ports, or with individuals who clandestinely created homemade tattoo apparatuses to ink fellow inmates or fellow gang member in prison. Skills were acquired by apprenticeship and through the repetitive application of key images such as hearts, daggers, and names on the skin of clients. Tattoo clients chose the image from drawings displayed on a wall and had little input on the designs they applied. [caption id="attachment_13341" align="alignnone" width="590"] No Pain, No Gain (Portrait of the artist Jeffrey Lutz), Sergio Sanchez, oil on linen, 2011. Courtesy of the artist. [/caption] Beginning in the 1950s, however, tattooing began to evolve beyond it social and iconographic roots as tattoo artists started refining and cultivating their techniques and artistry. Dramatic shifts in the tattooing environment, technology, and tools began attracting a much broader clientele, including many more females, older adults, and more affluent and artistically sophisticated collectors. Tattoo artists also began nurturing their skills beyond the tattoo shop and applying it to the visual arts. [caption id="attachment_13338" align="alignnone" width="590"] Pin-ups tattoo flash, Cliff Raven, India ink and watercolor on illustration board, c. 1970-75. Courtesy of Dale Grande/The Chicago Tattooing Co., Inc.[/caption] L.A.’s location on the Pacific Rim made technical and artistic developments in Asian and Pacific styles of tattooing accessible. Don Ed Hardy was one of the first Westerners to go to Japan to learn and master traditional Japanese tattooing technique. The introduction of the Japanese aesthetic to an American audience was one of the most prominent innovations in late-20th century American tattoo culture. Furthermore, Hardy’s protégé Leo Zulueta, a Filipino-American artist, raised the profile of “tribal” tattoo styles after being encouraged by Hardy to study indigenous Bornean and South Pacific tattoo designs. Zulueta’s reinvention of these traditional designs came to complement the intersection of tattoo with punk aesthetic. 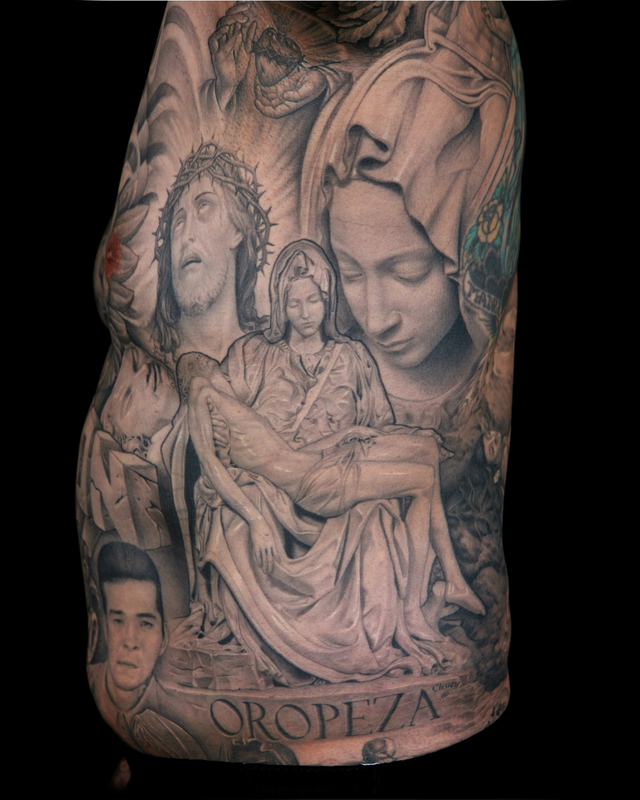 [caption id="attachment_13337" align="alignnone" width="240"] “Pietá” and other tattoos, Chuey Quintanar, digital silver gelatin print, 2009. Photograph: Edgar Hoill. [/caption] A particularly outstanding tattoo style that emerged in L.A. in the late 1970s has been the Black and Grey or fine line technique, a single-needle method that was developed to resemble prison tattoos. A highly-realistic form of tattooing, the fine line attributes of Black and Grey resulted in unprecedented detail, depth, and shadow. Much of the iconography related to fine line draws from Chicano cultural sources, such as Mayan and Aztec symbology, Catholicism, and references to Chicano socio-political sentiments. Photographer Edgar Hoill’s documentation will illustrate the work of artists Jack Rudy and Freddy Negrete, who pioneered this culturally significant style. 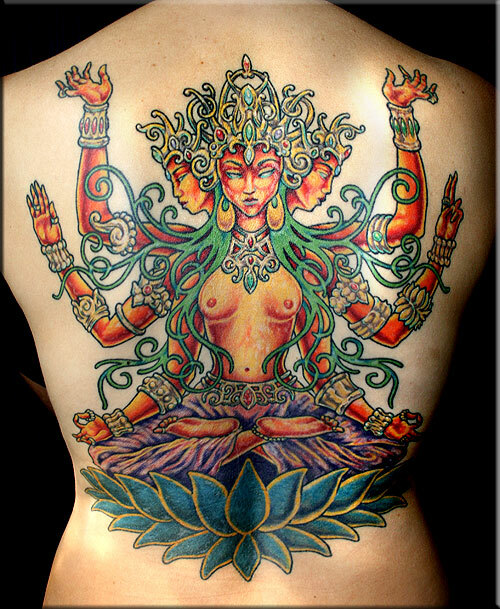 [caption id="attachment_13339" align="alignnone" width="246"] “Goddess of Fire” tattoo, Zulu, color photograph, 2008. Courtesy of Zulu Tattoo. [/caption] The importance of lineage is still revered in the contemporary tattooing community, as the acquisition of skill and practice operates on a basis of apprenticeship. Contemporary figures such as Zulu studied with Leo Zulueta, who in turn studied with Hardy. These artists, in turn, have fostered current movements and innovations that testify to tattooing’s growing position as a respected and accepted visual art form. Many of today’s tattoo artists, such as Shawn Barber and Carlos Torres, have developed a reputation for painting and drawing as much as for tattooing. 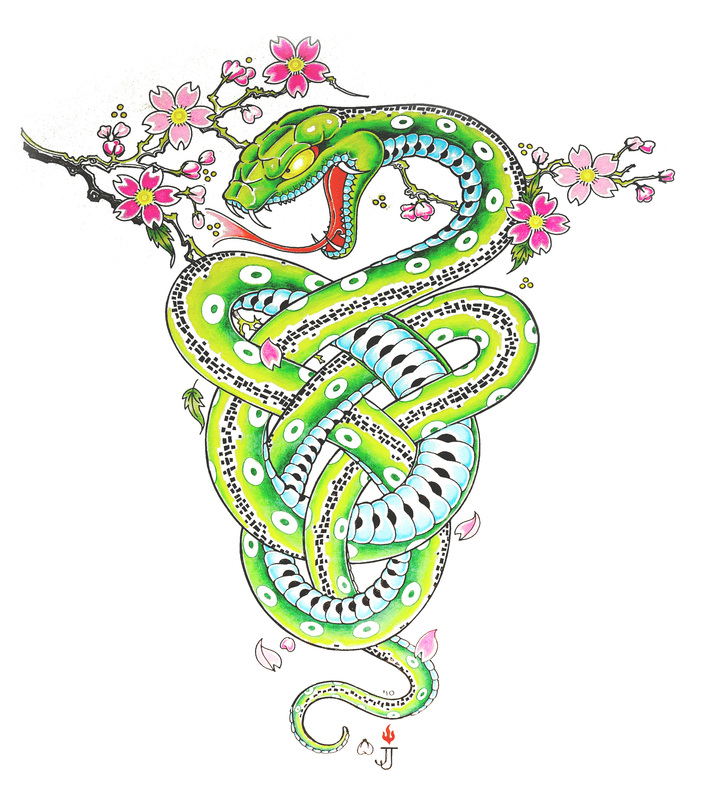 [caption id="attachment_13340" align="alignnone" width="264"] “Celtic and Japanese Snake,” Jill Jordan, Ink and Prismacolor on vellum, 2010. Courtesy of the artist. [/caption] Through “flash” (tattoo drawings on paper and board), photographs, tattoo equipment, and related art and ephemera, L.A. Skin & Ink will feature several noteworthy artists and the stylistic movements that have helped define the significant role of Los Angeles in bridging tattoo with fine art. Participating artists include: Bert Grimm, Bob Shaw, Don Ed Hardy, Cliff Raven, Jill Jordan, Leo Zulueta, Jack Rudy, Charlie Cartwright, Edgar Hoill, Estevan Oriol, Mr. Cartoon, Zulu, Sergio Sanchez, Carlos Torres, Shawn Barber, Camila Rocha, Sean Cheetham, and more. Supported in part by the Department of Cultural Affairs (DCA), The Antonia and Vladimir Kulaev Heritage Fund, and the Pasadena Art Alliance. Additional support provided by Sullen Art Collective. In addition to the exhibitions on view, CAFAM hosts the Shop@CAFAM, an on-site and online shopping experience that features fair-trade art and handicrafts from local and global artists and artisans. For current program and exhibition information call 323-937-4230 or visit www.cafam.org. Museum Tours: For group tour information, call 323-937-4230 x28.